We specialize in the cultivation of over 75 varieties of cut flowers & herbs from late June through early October. We use organic farming practices- purchase organic seed when available, use local, organic compost and potting soils, and never any chemical fertilizers or pesticides. ﻿"Our flowers are local, healthy, and beautiful." 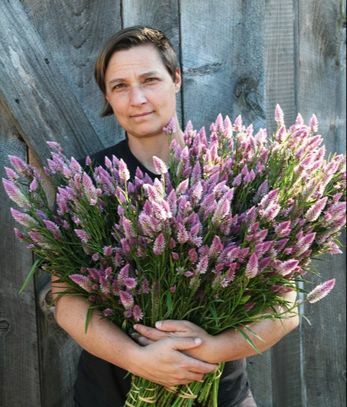 Sarah Barkhouse,﻿ ﻿Visionary/ Farmer-Florist at Vera Flora Farm. 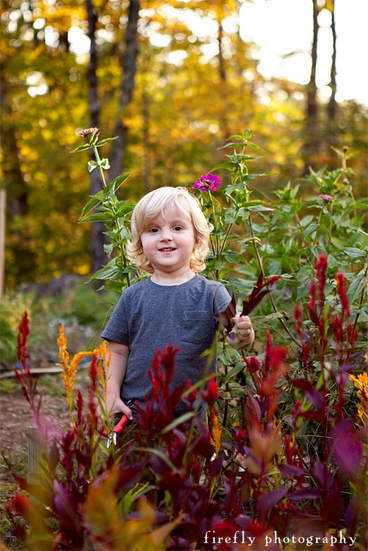 Sarah has been growing and arranging flowers organically in the Monadnock region of New Hampshire since 2007. She has provided flowers for hundreds of weddings and events in New Hampshire, Vermont, Massachusetts and Connecticut. 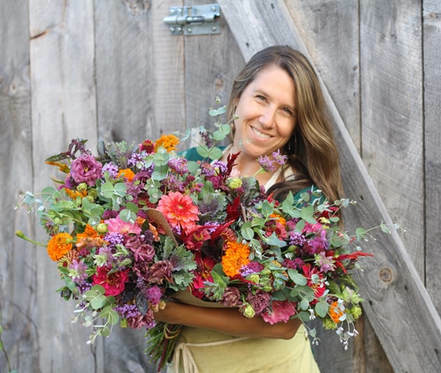 Sarah has a degree in Horticulture from UMass Amherst's Stockbridge School of Agriculture and has been enchanted by gardening and flower arranging since she was a child. Sarah's favorite flower is a Peony. Vanessa has been working alongside Sarah since the beginning and is involved in every aspect of the flower farm (except the arranging, and she likes it that way!) From pounding posts to digging dahlias, Vanessa loves getting to use her hands to work hard outdoors. 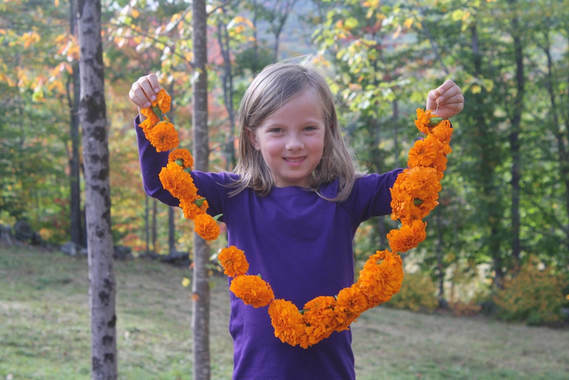 Her favorite part of all this flower-farming business is simply witnessing the Joy the flowers bring to our customers. Vanessa's favorite flower is a Dahlia. Willa,﻿ ﻿Mini-farmhand and Arranging Apprentice. Both Willa and Vera Flora were est. April 2012! Sarah recalls wearing Willa in the baby wrap while sowing seeds in the greenhouse that first season and Willa would end up with potting soil on top of her head! At 5 years she can name dozens of flowers, is handy with a set of clippers, and loves making mini bouquets and flower confetti! Willa's favorite flower is a Black Eyed Susan. Heath,﻿ ﻿Mini-farmhand and Assistant Equipment Operator. Heath is Vera Flora Farm's youngest helper. He loves all things to do with trucks and tractors. His first car will probably be a dump truck. Much like his sister he is enjoying getting to use clippers to cut flowers and practice making arrangements. 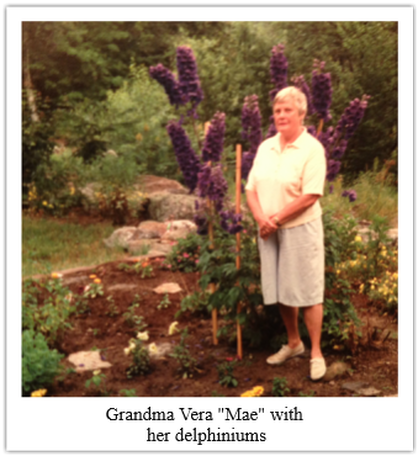 Vera Mae, whom Sarah believes she inherited her passion for flower gardening from. Vera also means Truth in Latin and refers to the flowers being grown organically and within their natural seasons. Vera Flora = True Flowers.